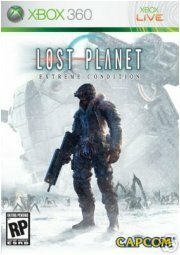 Game: "Lost Planet: Extreme Conditions"
Review: It's true that movie tie-in games are typically awful. However, games based off of ideas from movies actually do have a good chance of being worthwhile. Capcom first noticed this when they turned out the familiar Dawn of the Dead "zombies + mall" formula, and they got to see a little more of it with Lost Planet, a game that borrows some story elements from Starship Troopers, but not enough to have to throw out a disclaimer. The game takes place on EDN III, an eternally-wintry planet that is apparently seen as desirable by colonists, as they are willing to fight giant bug-like creatures called the Akrid for control of the world. More locally, though, you control Wayne Holden, the son of one of the colonists who remained on the planet to fight the Akrid. Unfortunately, Wayne's dad bites it in a fight with a massive Akrid called Green Eye, and Wayne escapes, minus his memories. A handful of "snow pirates" find him, and he decides to stay with them out of gratitude, or until he can find his dad's frozen corpse. I'm not sure his exact reasoning. Wayne himself handles the group's military operations, thanks in part to a "harmonizer", a devise that keeps him alive using thermal energy. One would think a device that runs on thermal energy would be a liability in a frozen wasteland, but luckily, these Akrid are packed full of the stuff, and if you can kill them, you can heal yourself up with some of their glowing orange-yellow goo. The story goes on from there, but it's just too ridiculous and melodramatic for you to pay any real attention to it. On the plus side, you may want to watch the cutscenes in the game just for the graphics, as ingame graphics and cutscenes are very well done. Both humanoid and Akrid characters are extremely well animated. The developers were also careful not to include too many jarring animation transitions. The bottom line, however, is that the way a game looks should always be second to how it plays. During his campaign against the Akrid, Wayne will come across a number of weapons like rocket launchers, shotguns, lasers, etc. These weapons are both varied and useful in their application, but the best part of the game is the Vital Suits. You see, these puny colonists weren't doing very well against the Akrid until a few them decided to use the Akrid's precious thermal goo to power some freakin' mechs! That's why all over the frozen world, you'll find a wide variety of VS's that you can jump into yourself or highjack from your enemies. Early in the game, you'll only find simple VS's with limited abilities, but further in, you'll find VS's that can hover, dash, jump high, and even a transforming tank VS. And if your VS gets a little trashed, you can just yank one of the giant guns off of it and take it with you! All told, the game has 11 missions, and a good mix of missions against Akrid, and missions against human foes with VS's of their own. Even so, though, the single player portion of the game seems to go by awfully fast, especially when you skip through the oft unintentionally hilarious cutscenes. They make up for it with some truly excellent boss fights, which have become almost synonymous with Capcom. It's not an overly-difficult game either (especially if you're playing the PC version with mouseaim), but that, too, is a nice change of pace from the entertaining, but punishing, Devil May Cry series. I'd recommend this to anyone looking for a good action game, but isn't necessarily that concerned with plot. The game itself is fun (if short), but the story is basically little more than a parade of bad haircuts, and female characters running around a subarctic climate with exposed cleavage. And all the detail is put into the characters' faces, so it's not like anyone's enjoying the show. I rented this, but after about 15 minutes I gave up trying to enjoy it. Very meh. JJ: Yeah, I have one and they're really not worth it. Two or three good games don't really justify the price tag. What's not to like, aprt from the story? I dunno, I just didn't dig on it. I'm one of those people that can't really get into recent games with a weak story, though. Hell, I'm the sort of person that bitched about Gears of War for having not enough exposition. A strong narrative is extremely important to my enjoyment of a modern (I.E., PS2-generation onward) game. So basically, I couldn't get into it because of the story. Your review said waht I've heard from friends about this game; pretty good, but not really outstanding or anything like that. And at this point, how many games I get is getting pretty limited (stupid concept of money); thus, I need to be very selective in my purchases, and I don't see this one making the cut. But a friend of mine's got it, maybe I'll borrow it for a bit (I do love games with alien baddies munchin' on people, and the snow enviorments seem like a nice touch). On a side note, Dead Rising was excellent beyond all known measure. You should review that one at some point. Ah. So I take it you didn't like Dead Rising because of its cheesy story. I can't wait for the Dead Rising sequel. I loved it, it plays really well. Far too short for me though, by the time it ended I was like. :D.... Wait, it's over! ?